In a pot, warm milk with 1/2 stick of butter until the butter is melted, but don't let it boil. Let the mixture cool about 3-5 minutes. You want the milk warm enough to activate the yeast but not too hot that it kills it. 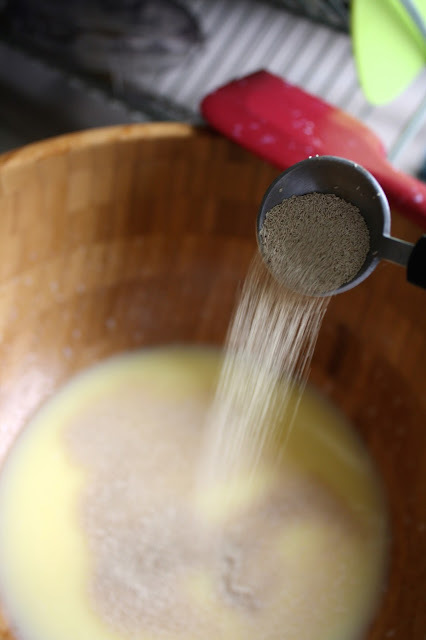 Add mixture to a large bowl and sprinkle on yeast, letting it sit for 10 minutes. You might see it start to bubble a little. Then add white sugar, salt, and 1/2 cup flour. Stir, then add the rest of the flour, 1/2 cup at a time until dough is sticky but combined. Knead the dough with your hands till the flour is incorporated. Drizzle the canola oil over your dough ball to keep it moist while it rises. Cover the bowl with plastic wrap and let sit for about an hour. 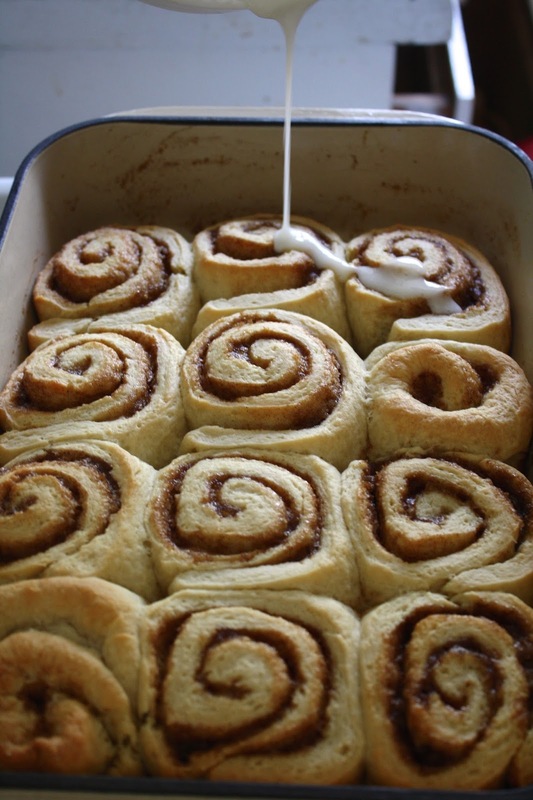 While your dough is rising, combine brown sugar and cinnamon. After an hour, your dough should be big and fluffy like the photo above! This is a good time to preheat your oven to 350'. Then transfer your dough to a cutting board and roll it out into a rectangle. The dough should be about 1/4 inch thick. 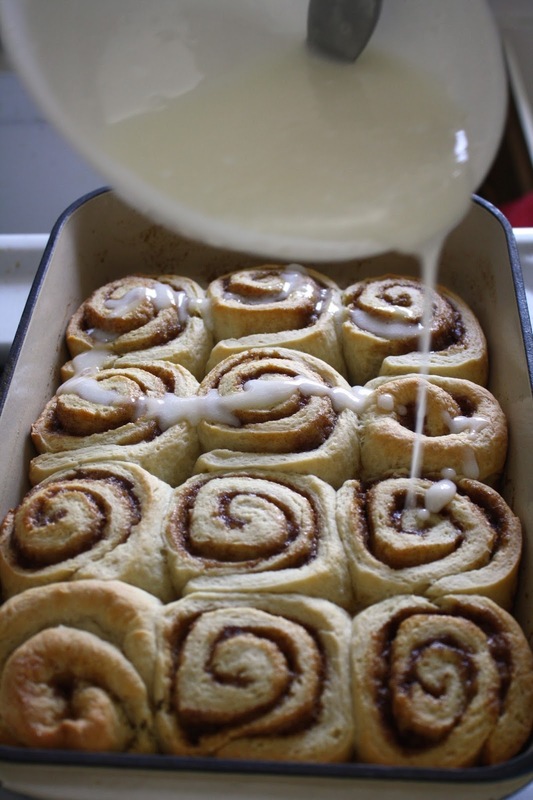 Add the cinnamon sugar along the surface of the dough. 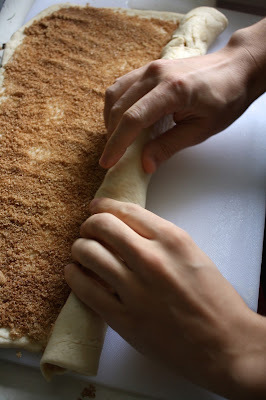 Roll the dough all up into a long log. Then slice in half, then into thirds to make 12 even pieces, about 1.5 inches wide. If you want smaller rolls, then simply wrap your dough tighter and cut your pieces smaller, into about 16 pieces. If you want jumbo rolls, then keep your dough thicker and slice them into about 8 large rounds. Transfer the slices into a baking dish with the swirl side up. Then take the other 1/2 stick of butter and melt it, then drizzle it onto the surface of the rolls. Bake in the oven for 25-30 minutes until slightly golden. While they're baking, you can make an easy frosting by stirring together powdered sugar, vanilla, and milk. Remove rolls from oven and let cool a few minutes, then drizzle frosting on top! Tah-dah! You made yourself cinnamon rolls! 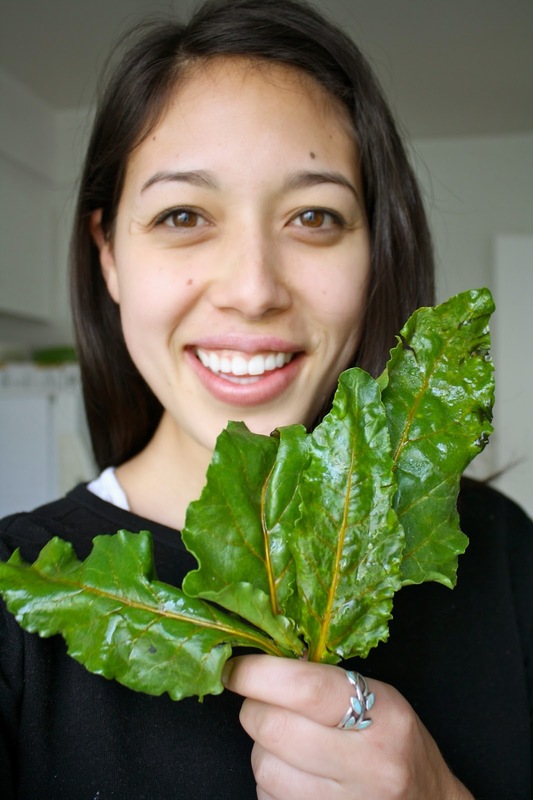 Now eat one (or maybe two) and you can save the rest in the fridge for a few days, or they freeze pretty well too! Just be sure to cover them and if you want to eat one down the road, you can just nuke it for 40 seconds to get it warm and gooey again.